Every month I post about my clothing budget. My budget per month is $350, which may seem like a lot to some and a little to others, but feels just right for me. You can read my thoughts on my 2018 budget here. Steve Madden Booties (also available here) - originally $109.95, on sale $79.96. I kind of shied away from sock booties when they came onto the scene just because I wasn't quite sure how to wear them. But now I've realized that they are amazingly comfortable. Just like the sock-style sneakers I've been wearing, there's absolutely zero rubbing at the ankle which is amazing because almost every pair of booties bothers me there. And in the winter, you can tuck the sock part into your jeans or tuck leggings into them, and still wear regular socks and not have cold ankles. Win win win. If you're considering these, snag them fast as they look to be selling out! Target Sweater - $27.99. I was having a bad day last week and went on a little shopping binge (nothing like a little retail therapy!) and this sweater was one of the things that made it home with me. It is so soft and I love the pretty stripes, it reminds me of a Madewell cardigan I wanted all season but couldn't buy because of the wool content. I sized up to an XXL in this but tried on the XL too and could have gone with that as well. Halogen x Atlantic-Pacific Striped Sweater - $59.00. 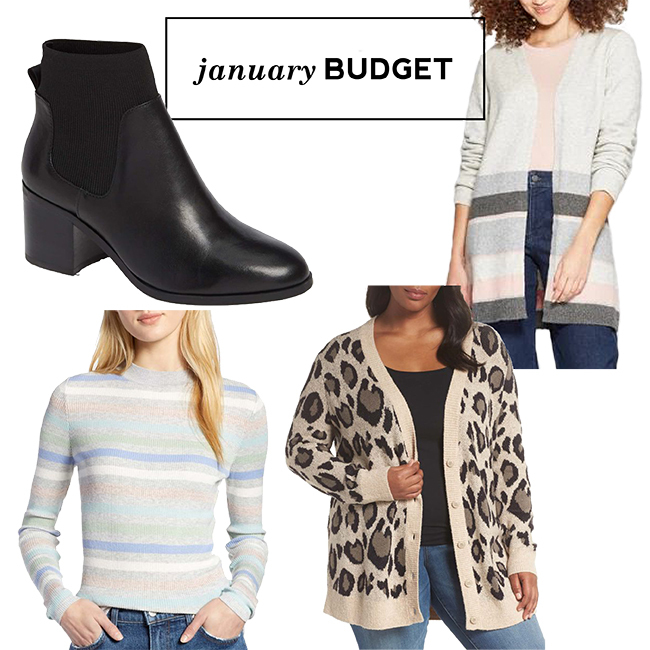 Another gray and pastel striped sweater - can you tell what I'm feeling this winter? I wore this sweater here and love it, the stripes are so cute! I sized up to an XXL in this also to accommodate the bump, but I think it would run true to size if you weren't pregnant - it's meant to be pretty fitted. Sejour Leopard Cardigan - $99.00, used Nordstrom Note $0. I've seen a few leopard sweaters around this fall and really wanted one, but again had problems finding one that wasn't itchy. This one is so soft and cozy, and I think the leopard pattern is the perfect scale. I've worn this a lot so far as I run out of clothing options, you can see it on my Instagram here. Did you budget in January? Find any good scores? ?